This white paper covers two crucial innovation topics. The first is what makes Innovations work – the behavioural science that makes some ideas gain widespread acceptance while others stumble. The second is how to predict successful Innovation, bearing this in mind. 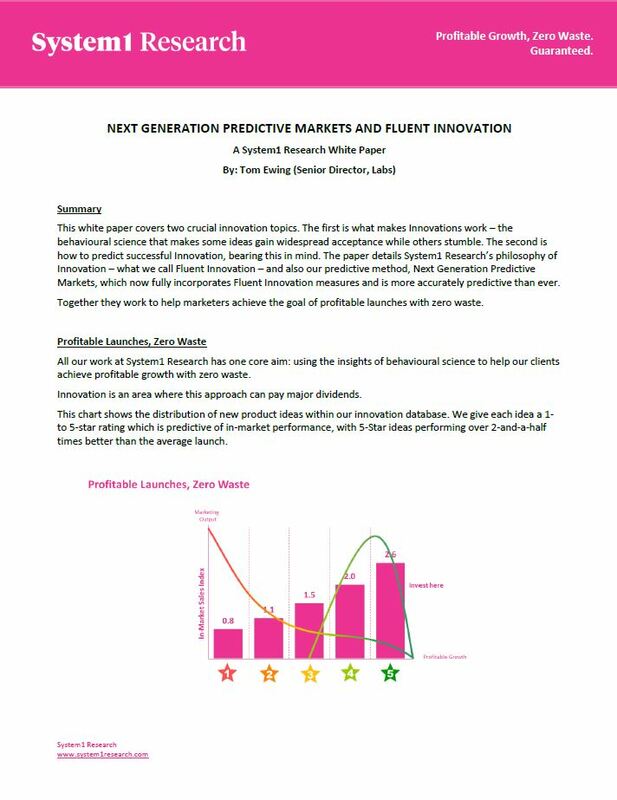 The paper details System1 Research’s philosophy of Innovation – what we call Fluent Innovation – and also our predictive method, Next Generation Predictive Markets, which now fully incorporates Fluent Innovation measures and is more accurately predictive than ever. Together they work to help marketers achieve the goal of profitable launches with zero waste. System1 is a global marketing consultancy that uses prediction to help clients drive profitable growth with zero waste. We are trusted partners to some of the world's most famous and successful businesses. Design your marketing for System 1.